Stem Cell Therapy is seen as a strong candidate to treat Alzheimer’s and is currently undergoing human clinical trails to determine it’s efficacy in slowing or reversing the symptoms. Alzheimer’s is a neurodegenerative disease that affects the brains and is the most common cause of dementia, affecting memory, thinking and behavior. Researchers at University of Miami plans clinical trials to study the use of stem cells to slow or reverse the symptoms of Alzheimer’s disease. more…. Alzheimer’s is a neurodegenerative disease that affects the brains and is the most common cause of dementia, affecting memory, thinking and behavior. It is estimated that there are 46.8 Million people worldwide who are suffering from dementia and is expected to reach a worldwide figure of 131.5 Million people by 2050. This has alarmed governments worldwide and it would greatly increase the cost of healthcare and affect the socioeconomic levels of the country. Researchers still do not know the exact cause of Alzheimer’s but believe multiple factors including genetic makeup, lifestyle and environmental factors contribute to the development of this debilitating disease. Although root cause is unknown, research has highlighted that people affected with this disease have displayed an abnormal build up of certain proteins in the brain. One of these proteins, known as amyloid beta, group together, forming “plaques” while another protein called tau gets twisted together and form “tangles”. It is believed that these proteins prevents neurons in the brains from communicating properly or even prevent them from getting the nutrients it needs, causing these neurons to die off and loss a larger amount as the disease progresses. There are currently no known cure for Alzheimer’s and patients are currently treated with drugs that help to reduce the symptoms such as improving memory, or helping with daily tasks. 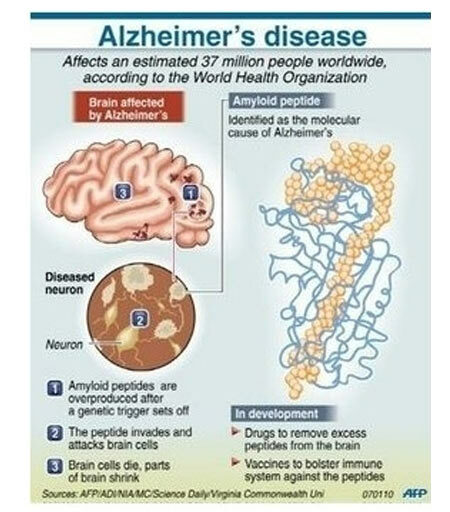 The class of drugs known as cholinesterase inhibitors (aricept, Exelon, Razadyne) are used during early to moderate stages of Alzheimer whilst memantine (Namenda) is used from moderate to severe stage of alzheimer’s sometimes together with aricept as well. Stem Cells to remove protein that builds up and clogs neurons. There are many ongoing efforts to understand how stem cell therapy is able to help people with Alzheimer’s. 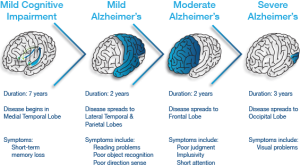 One of the main centres is the California Institute of Regenerative Medicine, where you can view the areas of research being conducted specifically to understand Alzheimer’s.